Charles River tableau as seen from a kayak. The tableau on a point jutting into the Charles River in Newton, MA, is a welcome sight on hot summer days: the owners fill the copper tub with water bottles for thirsty kayakers and canoeists. Their property teems with whimsical statuary, including an alligator crouching on the shore, an iguana perched on an overhanging branch, a black bear rearing up on hind legs (with cub underfoot), a family of three white-tailed deer, a giant Galapagos tortoise, and more. And no, the great blue heron shown in the next photo isn’t one of their life-like statues – it’s the real deal in a cove just around the bend from the bison – but I wouldn’t be surprised if one day they added a heron statue to their menagerie. Great blue heron poised in the Charles River. File this post under just for fun. Thanks to Cheri Lucas Rowlands and WordPress for their Weekly Photo Challenge: Letters. Thanks to Sue for her Word A Week Photography Challenge: Water. Posted on May 1, 2014, in A Word A Week Photo Challenge, ardea herodias, Art, Bird photography, Birds, Great Blue Heron, Kayaking, Nature, Photography, postaday, Weekly Photo Challenge, Wildlife Photography and tagged great blue heron, postaday. Bookmark the permalink. 9 Comments. I am glad I didn’t miss this fun post! Wouldn’t you love to meet this couple? Very glad to hear that you like this one, and I agree – I’d love to meet the people with their wonderful sense of whimsy, too. Thanks for visiting and commenting. Great two-fer in response to the challenges! That is neat that those folks do that. I left Newton in 1968 to move to California. I can’t believe I wasn’t aware that the Charles was so close! Used to live within a couple of blocks of Crystal Lake. We could almost have been neighbors! Thanks, Gunta, and what a small world, Newton, eh?! In 68 I was in Pittsburgh, not MA, but in the early 80s I was in CA. Maybe we could have been neighbors there and then instead?! Love that heron shot – I really like images that show the bird in situ. 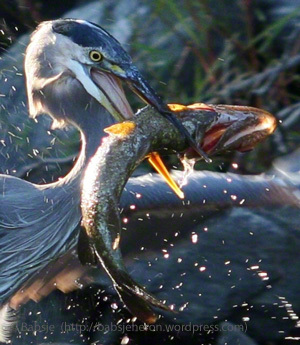 Many thanks, Stewart,I’m really glad you like that GBH photo – that’s one of my favorite settings on the river.